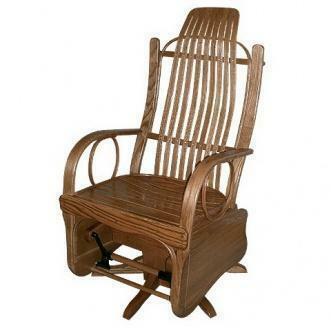 If you love cabin or lodge style furniture, consider our Amish Bentwood Round Arm Swivel Glider. Available in oak, brown maple, or cherry, this swivel glider features beautifully steam bent arches, curves, and waves throughout, as well as a solid side panel base. Made in the U.S.A. by Amish craftsmen, add a relaxing rustic touch to any room with this solid wood glider.